Sorry, just had to steal the Taipei Times subhed for the title. The TT today runs a story on yet another Taipei City failure after the ridiculous ongoing story about the Neihu MRT line (two different train systems on one and the same line! 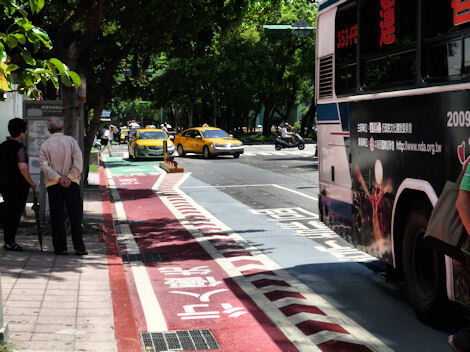 ): the Dunhua bicycle lane. Read it here. I've been meaning to rant about for the last month or so, but never got around to doing it. For NT$100 million (US$3 million), it is completely useless. For example, It runs on the road between traffic and bus stops, which means that buses constantly stop on it. All the lines are in concrete instead of painted on the road, so it feels like riding on cobble stones. At places it is about 0.5m wide. Drivers stop on it constantly to get out of the car and run some errand. They should have widened the sidewalk and put the bicycle lane on the side walk, off the road, or done nothing at all. A total waste of my tax money. A bus stop. The bicycle lane runs along the side of the road on the green concrete pavement inside the black and yellow curb (which at random sections separates the bicycle lane from the car lanes) that ends just ahead of the two taxi cabs. Then the bicycle lane turns red and runs between the bus stop and the bus lane, with the text "Pedestrians first." After the bus stop, it turns green again and becomes a bicycle lane where bicycles are supposed to have the right of way. All text and lines are concrete so the ride is all but smooth, and it feels more like riding on cobble stones. The problem is not so much the bicycle lane, but the attitude of taxi drivers, taxi passengers and bus drivers. In other countries, e.g. the Netherlands, France and Germany, bus drivers stop for cyclists on this kind of lanes, taxi drivers stop only at areas where they are allowed to stop, taxi passengers look for cyclists of they open the door. Well, I cycled along Dunhua and nothing of this happenend. Taxi passengers are surprised when you ask them why they did not look behind if a cyclist is approaching – and bus drivers are well aware that they drive a heavy car so that a cyclist will stop anyway. I agree. Drivers stopping to get out and do an errand or let passengers off. But I don’t think I’ve seen bus stops in the bicycle lane anywhere else than on Dunhua. And you can’t tell a bus driver that he can’t stop at the bus stop because there’s a bicycle lane between the bus and the stop. Anyway, drivers act as if the bicycle lane doesn’t exist, and so the whole exercise is a waste of money. The city has spent US$3 million, but the situation is exactly the same as it was before they had spent a single cent. That’s why I think they should have expanded the sidewalk and put the bicycle lane there or done nothing at all. Well you need to take the space from somewhere, so either the sidewalk will get smaller or the road will get smaller. If you put the cycle lane on the sidewalk, then you are (somewhat) shielded from interference from cars, but then you’ll have pedestrians walking on the cycling lane. You can’t use the road to overtake slower cyclists, either. No matter where you put the cycling lane, there will always be interference from cars dropping off passengers. I think in Germany the majority of cyclists would prefer not having cycling lanes (with a few exceptions here or there). For the reasons named above – there is really no good way to implement a cycling path. I would disagree with Jens about the alleged courtesy of bus and taxi drivers in Germany. At least the latter are constantly blocking cycling lanes in Munich. In general the paths around here are too narrow, used as auxiliary parking spaces and often walked on by pedestrians. I think a lot of people here in Taipei think bicycle lanes are a good thing, so the basic idea is good. In the case of Taipei, since the city decided to take a lane of car traffic away, they should have expanded the sidewalk into that lane so that the sidewalk remained the same width, or done nothing at all. What they have done now amounts to having spent US$3 million to achieve nothing. The situation remains exactly the same as it was before the whole project was started: buses, taxis and car drivers stopping or parking next to the sidewalk so it is impossible to move forward in the right-most lane. I think we could take Jens’ line of reasoning one step further and say the problem also has to do with enforcement of the traffic laws — or rather their non-enforcement. In Germany, people generally follow laws, including yielding to cyclists and pedestrians, because they’ll be fined if they don’t. By the same token, a cyclist who fails to heed the law will… be fined. I don’t see any of that happening in Taiwan. Ignoring the law is not punished, so the law is ignored. That being said, enforcement of traffic laws would instantly improve life for everyone, with the possible exception of taxi drivers. Couldn’t agree more, although I must say that the traffic situation has seen unbelievable improvements since I came here in the late 1980s, for many reasons: people now drive much better than they used to, people are much more law abiding than they used to be, the MRT system now takes some of the traffic load and the many added elevated highways around the city take some of the load. And almost no one uses the horn as a substitute for the brakes anymore. Why not just use the grass area in the middle of the lanes which runs along the entire portion of DunHua? There is already a sidewalk there which nobody walks on. It would be perfect, except for maybe the occasional scooter making a short cut. I heard that path was orginally intended for bikes anyhow…. But that creates a problem at every intersection, and the intersections are big along Dunhua. Didn’t know that part was intended for bicycles. It would be nice to bike along under the shade of the trees. I would go so far to say that it is not only useless, but outright dangerous. Driving alongside it on my scooter about the time it was just being finished, I decided to count the “danger points” (based on my knowledge of how traffic works in Taipei and the attitudes of various drivers), and got about one every 2-5 seconds, driving along at about 30 km/hr, which is a typical speed for me to along Tunhua on my bike. After one ride along this new bicycle path, I now ride in the normal traffic lane, because I simply feel safer there. Riding with normal traffic, at least I know what to expect. Of course, there are now only two traffic lanes instead of three, so traffic is now more congested. Even now that the entire lane seems to be open, I still see more people either riding with traffic, or riding on the sidewalk than I do using the bike lane. It seems to get more use as a shortcut for scooters to get around traffic at lights than it does as a bike lane. I am astounded that this thing cost NT$100,000,000. And yes, the middle portion was originally supposed to be a bike lane, but at every intersection, you had to wait for three lights to get back on the bike path, so nobody ever used it.